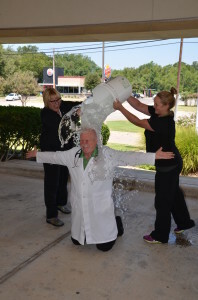 Striking Out ALS | Glen Rose Healthcare, Inc.
Dr. Davis was challenged to participate in the Strike Out ALS Ice Bucket Challenge, and he accepted! He was present on August 13th along with many onlookers at the front of the hospital. His clinical staff poured two buckets of ice water on his head, but not before he challenged two other community members to do the same. The challenge has been making national news for some time now, and has even included celebrity participants. For more information on ALS, follow the link below to the ALS Association webiste.